I tried a new brand of Greek yogurt for breakfast today. My sister-in-law works close to a Woodman’s and she offered to pick me up anything I needed. I got excited because I had just run out of Chobani last week and needed a big tub again desperately. Unfortunately, Woodman’s was out of the plain, so she got me a vanilla. 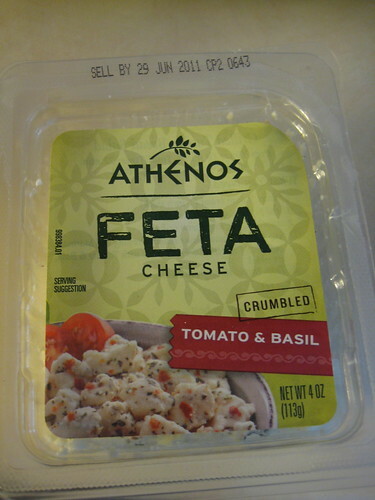 She also mentioned the Greek gods brand over the phone and I figured I would just try their plain. When she brought the yogurts over yesterday, I did a quick comparion of the nutritional stats and saw why the Greek gods yogurt was cheaper. 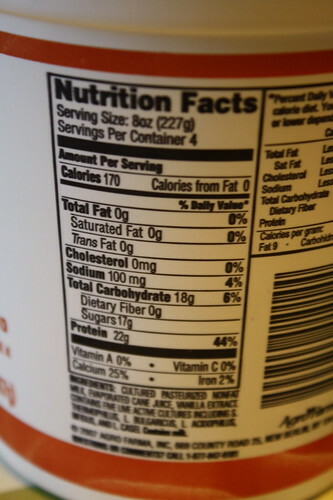 The protein was only 4g per 4 oz serving compared to Chobani’s whopping 22 grams per 8 oz serving. I may pay extra for the Chobani, but it’s worth it to me, especially because I eat a mostly vegetarian diet. 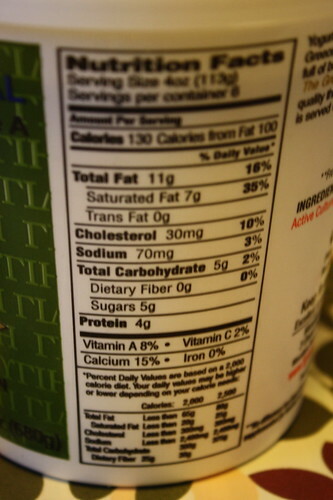 Also check out the fat content in each. 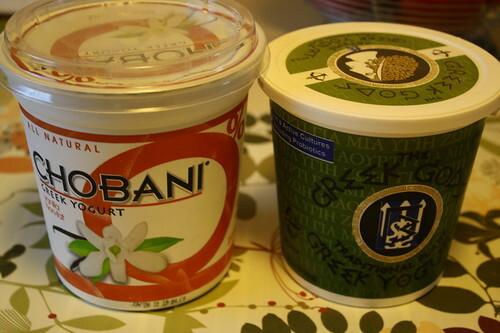 0 for Chobani’s 8 ounces, 11 grams per serving in the Greek Gods’ 4 ounce serving. Sure the sugar is higher in the Chobani, but that is because it is the vanilla flavored kind. So, I piled strabwerries, raspberries and Bonne Maman wild blueberry preserves on top. Because I am feeling sick lately, I couldn’t eat the whole bowl. Boo. I don’t think it was the protein filling me up or anything. The verdict? The Greek gods was just ok. I still prefer the consistency and flavor of the Chobani greek yogurt. Can plain yogurt have a “flavor?” I guess so in my opinion! 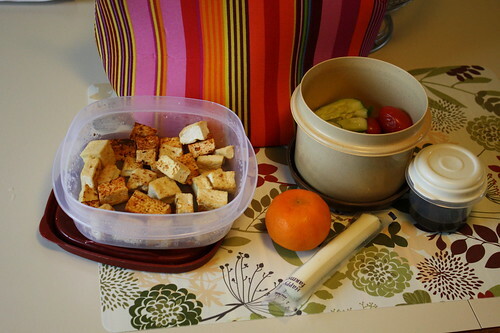 Lunch was a salad with grape tomatoes, cucumber, feta cheese and lots of tofu on top. I also had a string cheese. I couldn’t eat the clementine so I saved it for my afternoon snack. 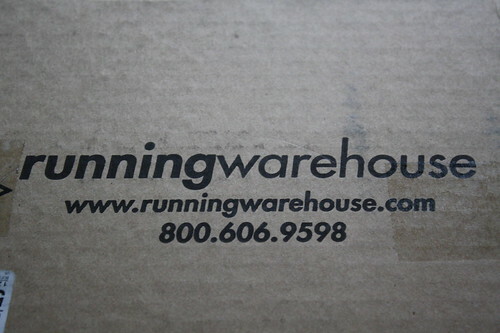 While I was meditating tonight, the UPS truck delivered my new running shoes from runningwarehouse! I got 10% off of them because Kelly from Beneath It All just picked up the same shoes and got her discount through Runblogger. They were only $71.95 and I get free return shipping if I am not satisfied! My Brooks Defyance shoes were over a year old and granted I didn’t do that much running in them over the last year, I did wear them to the gym, wore them on walks and probably while biking and playing tennis last summer. 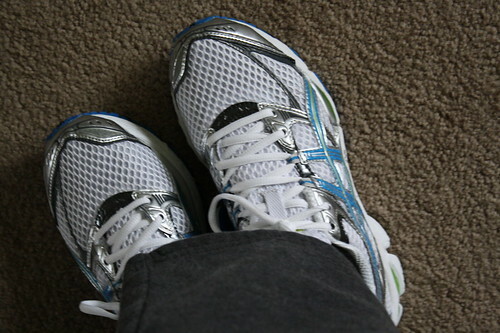 I decided to go back to my old favorite from when I worked at a running shoe store in California! 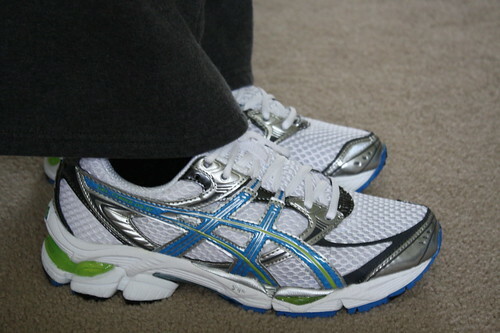 I got the Asics Cumulus 12. 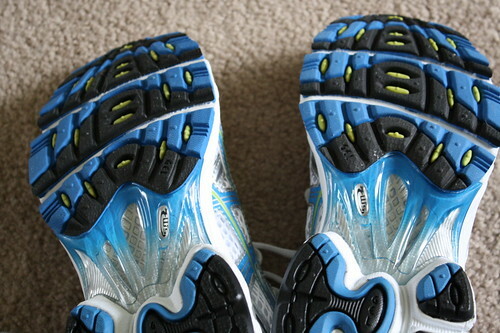 Since I have knee pain occasionally when running, I thought the extra cushioning would help me out. I wore them on the carpet and then for a bit on our kitchen tile and they felt so supportive and cushiony (is that a word?). I know that the feeling of the new cushion does wear out pretty quickly, but I remember that feeling lasting a while in my old pair of Asics. I thought I would go to the gym tonight, but then it was getting late and I was hungry. 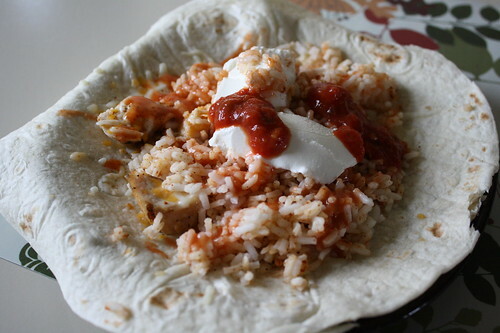 Craig was making a burrito, so I also decided to do the same and used chicken, rice, greek gods yogurt instead of sour cream, cheese, Penzey’s Arizona Dreaming spice, and Frank’s Red Hot. After eating too much food and with my stomach still giving me problems today, I decided to skip the gym and get out in nature with my husband. We went on a 25 minute walk around the neighborhood and covered a little over a mile. It felt so good to be outside, even though I missed doing my routine at the gym. It’s time to go read blogs and some magazines! I am trying to power through my magazine pile and I managed to clear three from my huge stack over the weekend. Tomorrow, I only have a half day of work because I have to go to Craig’s work for our annual Health Risk Assessment appointments. We get a discount on our insurance as a result, so it’s a must! After, I’m getting my haircut and a partial foil done! Can’t wait because my hair is at that nasty feeling stage–thick and the ends feel dry. As my title says, it was a very busy day by choice, but felt so nice and productive. At about 6:20, when we were sitting down and having dinner together, I said to Craig, “wow, this day went by so slowly, but in a good way because I got so much done.” Love those kind of days! 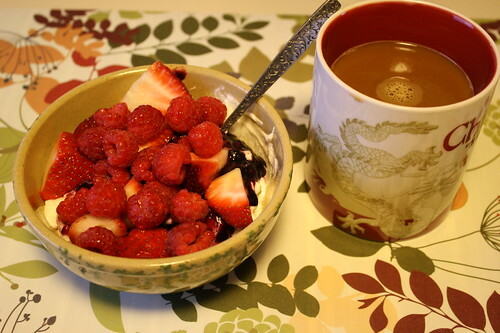 I woke up, meditated and then had a craving for oatmeal, so that’s what I made. 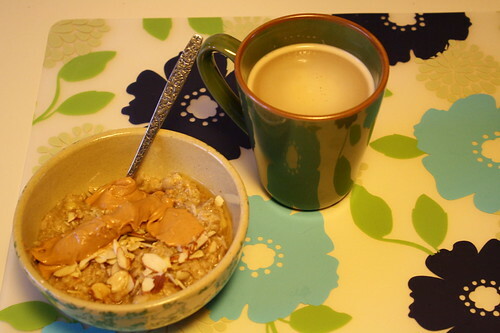 I wanted to go to yoga, but by the time I ate, it was getting late and I was SO full from the oatmeal. I decided to stay home instead and clean. 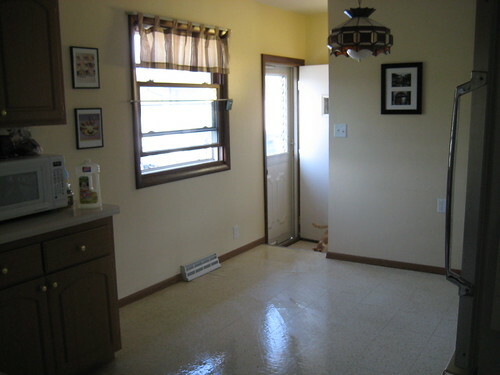 I was in one of my cleaning moods, so I threw laundry in, dusted, washed dishes, cleaned counters and the kitchen table, vacuumed, swept and got the kitchen ready for mopping. I managed to read my book in between cleaning too. 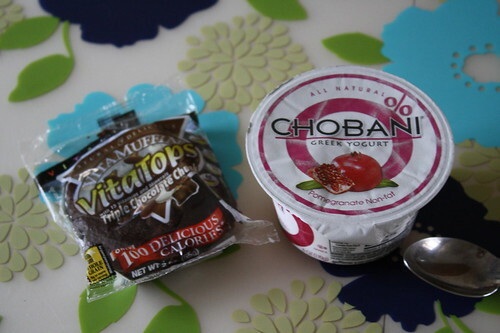 I wasn’t too hungry for a “real” lunch, so I had a pomegranate chobani and a triple chocolate chunk vita top. The vita top was delicious, as expected! Very chocolaty! Then I was off to Craig’s grandma’s 90th birthday party. I went late, after the meal was over, because I really didn’t want to pay $15 to have the meal choice they offered and there was no vegetarian option. They had fried chicken, ham, mashed potatoes, green beans, etc. I wouldn’t have enjoyed the meat and it probably would have upset my stomach. I just had a few bites of birthday cake. 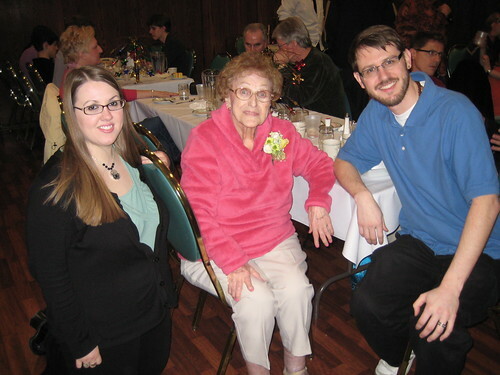 Here is my sister-in-law, Grandma, and Craig. After the party, I headed to Pick N’ Save to get some groceries on double double coupon day. I could double 10 coupons, which was great because we needed oatmeal, cereal, clementines, olive oil, etc. and I was able to save a lot of money today. 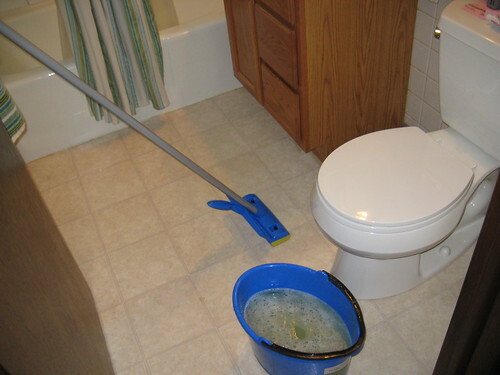 Then it was time to mop the floors! I really hate this chore more than any other in the house. It takes so much time to clear everything out and we just have a small kitchen and bathroom! Seeing shiny, clean floors made me happy though. I felt like the energizer bunny today. 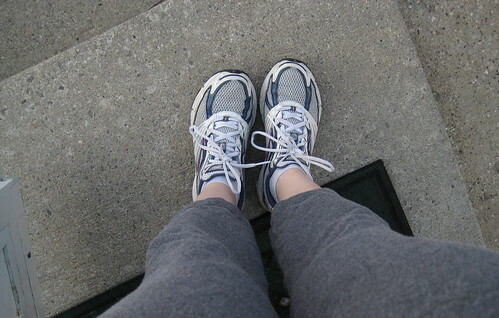 The next thing I did was lace up my running shoes and get outside for a 15 minute run. It felt so good to run outside opposed to the treadmill. I just wish I had a garmin to see what my pace was and the distance I completed. I know they aren’t that much money, but I am not sure it is worth the investment for me. Especially because I couldn’t use it at the gym in the winter. 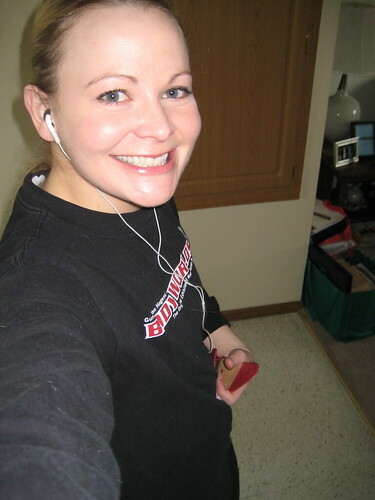 Clearly this is a (shiny) face of a very happy blogger who can get outside and run, at last! 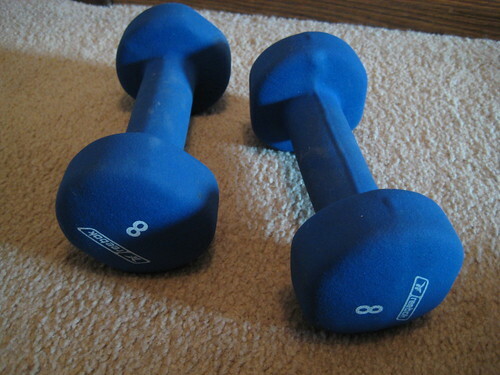 Because I didn’t go to the gym, I decided to lift my 8 lb. weights too. Dinner was delicious. 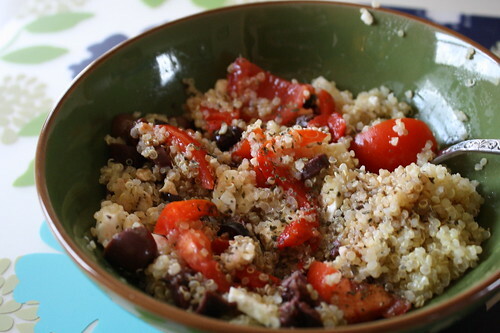 Every time I make a quinoa dish like this, I just go “mmmmm” throughout dinner. I made mine with kalamata olives, roasted red peppers, tomatoes, tomato basil feta cheese, dried basil and mural of flavor from Penzey’s spices, olive oil and balsamic vinegar. When I saw this flavor at the store today, I knew I had to try it in the quinoa dish. And after dinner, Craig and I went on a long walk around the neighborhood. It was nice to see flowers coming up and some even had bloomed already! They’re really going to go into action tomorrow when it’s in the 70’s. 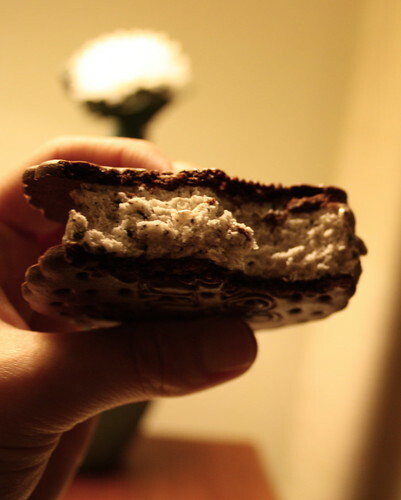 Right before I started blogging this post, I ate a skinny cow cookies n’ cream ice cream sandwich. Time to finish reading Animal, Vegetable, Miracle. I am almost done! Hope your Saturday was fantastic!